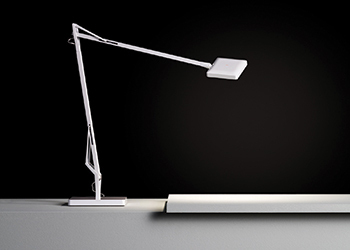 Flos, an Italian lighting design company, has launched Kelvin Edge, a new miniaturised version of its iconic task lamp Kelvin LED. Designed by Antonio Citterio, the lamp is updated while keeping the same emission of light, thanks to the new Edge Lighting technology. The optical switch is installed on the head, with a three-step dimmer and the possibility to activate the green mode – a new function that allows the light temperature to be set at 2700K or 3200K, switching from warm to cold light and vice-versa, says the company. Commenting on the Kevin Edge, Citterio says: “These products are ever more surprising from a technical standpoint and their size gets smaller and smaller. Through some highly sophisticated work on the details, the design of the Kelvin too is increasingly aligned with the evolution of aesthetic perception in our time. Flos, founded in 1962, has produced a number of lights that have become classics in Italian industrial design. These include the Arco lamp and Taccia designed by Achille and Pier Giacomo Castiglioni. Achille’s contribution to Flos has shaped the identity of the company. Flos works with the best designers like Patricia Urquiola, Jasper Morrison, Philippe Starck and Marcel Wanders to create lighting and light solutions for the modern home and commercial environments. Herman Miller, an American manufacturer of office furniture, equipment and home furnishings, has unveiled a new version of its iconic Aeron chair. When the first Aeron chair was launched in 1994, it changed the concept of seating on a “padded throne”. The designers Bill Stumpf and Don Chadwick did away with the foam and fabric, making it the first office chair ever without cushioning and fabrics. 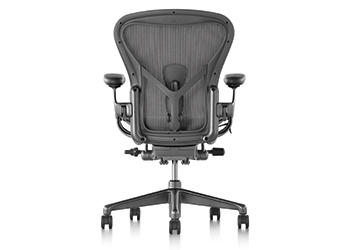 Herman Miller’s new Aeron retains the distinctive silhouette of the iconic chair, but every component of the design has been updated to raise the bar for performance seating. With the input of Chadwick, the original co-designer, and a dedicated team of scientists, engineers, materials specialists, and researchers who worked on the project for over two years, Herman Miller has enhanced the chair by combining the latest insights in anthropometrics and ergonomics with two decades of advancement in materials, manufacturing, and technology. The resulting chair is recognisably an Aeron, but features stronger and smarter materials, better adjustment capabilities, intuitive controls, enhanced aeration, and a health-positive, more comfortable sit. Aeron now offers a completely new experience of sitting – with a re-engineered tilt mechanism, adjustable PostureFit SL spinal support, and ground-breaking 8Z Pellicle zoned suspension working in concert to deliver enhanced comfort. For individuals, the chair accommodates the widest possible range of activities and postures people adopt while sitting – from intense upright focus to relaxed contemplative recline. For organisations, cross-performance design makes Aeron suitable for a wide array of workplace settings. A handle from the Mademoiselle collection. Haute Déco, a UK-based luxury architectural hardware manufacturer, has launched Mademoiselle, a new collection of statement handles, designed in homage to French fashion designer Coco Chanel. The new collection features a vibrant, multi-dimensional woven texture inspired by Coco Chanel’s legendary bouclé fabric launched in 1953 when the iconic Parisian designer reopened her couture house after a 15-year break. “Last Autumn’s Mademoiselle Privé exhibition at the Saatchi Gallery inspired us to look at Coco Chanel’s signature fabric and to translate it into bronze,” explains Marie-Véronique Swannell, Haute Déco’s founder. Focusing exclusively on high-impact, statement handles, the Mademoiselle collection is made up of a small number of high-impact handles for entrance doors and cabinetry, each relating in some way to Gabrielle Coco Chanel’s designs and era. 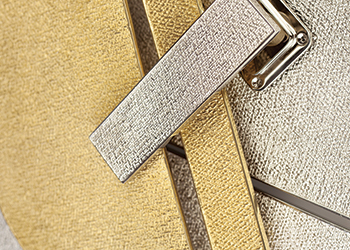 The collection is available in three finishes designed to complement its vibrant texture. It epitomises Haute Déco’s spirit of understated glamour.